RallySport Direct carries a great selection of Walbro fuel pumps and fuel pump accessories for those of you who need to supplement those modifications with a proper amount of fuel flow. Here, you are looking at the Walbro 255 LPH In-Tank Fuel Pump. 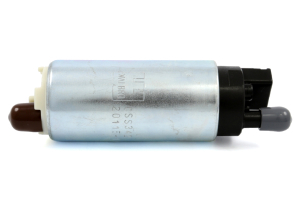 The 255 LPH has been widely recognized as the gold standard in the aftermarket fuel pump industry for more than 20 years. These are compatible with a wide range of vehicles and feature unsurpassed quality, durability, and performance. Bought this as I had moved from stock wrx blue injectors to sti pinks but went the vf48 route so I bumped up to 750cc injectors. Kit is completely plug and play, every part was used in the process making the switch an hour job with clean up. Compared to the stock pump, the only real difference is when priming the fuel lines. The Walbro is at least twice as loud but only for the span of maybe 2 or 3 seconds. Holds pressure great and so far am very pleased with the results. I’ve been running this walbro pump for atleast 6 months now. Still works great. There’s been like 2 times I can recall that i heard it running abnormally loud for about 30 seconds while the car was on. It was the middle of summer 90°+. I don’t know if that maybe had something to do with it. Otherwise no issues. Tight fit since the walbro was too long by about 1cm. That requires bending the bottom of the bracket down which is not pleasing but it worked. You can see what I mean in the picture. Also the clamps in the kit are not fuel line clamps. Besides those issues the install was a breeze. The pump is notably louder on start-up, but even on my very quiet car it’s pleasant and not heard from after that. It did require tuning since I had been at the limits of the stock pump. The new one put me a little rich at the top end but I would say a tune is not usually necessary. 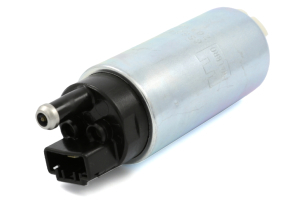 I had to change the fuel filter on my '04 STi and I figured I might as well upgrade my fuel pump while I'm in there... This kit comes with everything I needed. Direct fit. Easy to do. What is the maximum horsepower I could hit with this pump? A: We cannot guarantee a horsepower as there are too many variables. Will this fit in my 2006 wrx wagon? 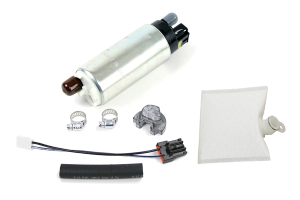 A: This fuel pump kit is confirmed to fit your 06 wrx wagon. A: This is only for 02-07 model years and will not fit your vehicle. '06 STi was running lean and hesitating/boost leak was present. Bought the 255 thinking it was the pump. After the install the CEL was gone and it idles a lot better but the car has a bad boost leak and hesitates and bogs on full boost. After letting off the throttle at any speed the car lurches as well. Is this still the fuel pump issue? A: A boost leak cannot be related to a fuel pump as fuel does not run in any part of where the boost is flowing. You are going to need to have a mechanic diagnose your car. 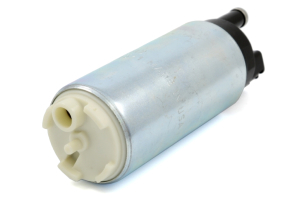 A: This fuel pump is E85 compatible, although you may want to go for a higher LPH pump, depending on your power goals.